Wallace MacAskill (1887-1956) is one of Nova Scotia’s foremost photographers, lauded for his portraits of seascapes, sailing and fishing ships, and picturesque landscapes. In this remarkable collection of then and now photographs, Len Wagg follows in the footsteps of 50 of MacAskill’s best shots, recreating them in colour contemporary portraits. Through side-by-side comparisons, readers see how much has changed, and how much has remarkably remained the same. Included are urban streetscapes, important events and monuments, and spectacular scenery from around the province, Halifax to Louisbourg, Chester to Pictou. The 100 photographs in this book are captioned with short anecdotes conveying the significance of the images and the process of finding the location for some of MacAskill’s original work. The magic of Peggy’s Cove at night, the rugged shorelines and clifftops, the magical expanse of the Cape Breton Highlands mid-winter—all represent the beauty that is Nova Scotia. Journey through this incredible landscape with award-winning photojournalist Len Wagg. These remarkable photos not only capture the immense beauty of Nova Scotia’s natural landscape but also capture the spirit of the people who live in it everyday. 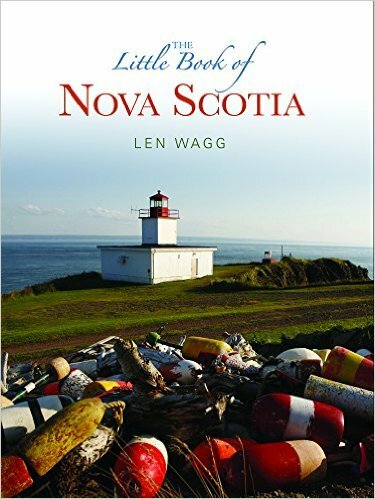 Features approximately 85 photos with captions and a foreword from popular Nova Scotia writer Silver Donald Cameron. Now in a smaller format and with 10 new photographs. Nova Scotia is celebrated the world over for its rugged coastline, charming villages, and pristine wilderness. The province's natural beauty is on full display in this incredible collection of images from photographer Len Wagg. Vivid, colourful photographs of the spectacular coastline along the Cabot Trail, the Peggy's Cove lighthouse under a sparkling night sky, and the rich farmland of the Shubenacadie River Valley--among many others--reveal the very essence of Nova Scotia. For long-time residents and first-time visitors alike, these unforgettable images affirm the province's reputation as one of the world's cultural and natural treasures. Nova Scotia has designated thirty-three Crown-owned areas as Wilderness Areas, consisting of about five percent of the provincial land-mass. The wilderness area designation means no mining or logging is allowed, but people are free to hunt, fish, hike, and camp as they have for generations. These Wilderness Areas - from the massive Tobeatic Wilderness Area that covers five counties to tiny McGill Lake- showcase the best of natural Nova Scotia, and Len Wagg has photographed them all for Wild Nova Scotia. Over the last year and a half, Wagg spent close to a hundred days in the province’s wilderness, logging over fifteen thousand kilometres and taking beautiful, telling portraits of the province’s most secret and lovely places. Photos of important areas not designated Wilderness Areas are included as well- like the shores of the Northumberland Strait, where herds of seals find places along the shores to have their young; the Bay of Fundy, where world-class tides erode massive cliffs; Keji National Park, where the sounds campers hear are all natural; and Nova Scotia’s “barren” Sable Island, home to birds, plants, seals and a herd of wild horses. Each area has distinctive characteristics that make it unique. Wild Nova Scotia showcases the special places, protected or not, allowing people to bring home some of the amazing natural beauty of this province.